12 foot hose extension kit is designed to attach to the end of your upright vacuum cleaner hose. Expands your cleaning area, allowing you to vacuum your hard surface floors or stairs with ease. 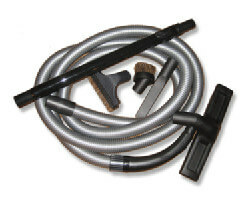 This extension kit comes with a 12 ft hose, floor cleaning brush, upholstery, and crevice tool.